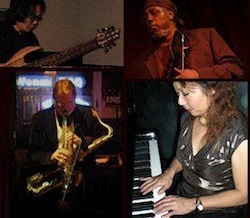 Fans of the legendary saxophonist Sonny Rollins should enjoy the sounds of the Wilbur Rehmann Quartet: Special Edition, performing this Friday night at the Sheba Lounge on Fillmore. An accomplished alto, tenor and soprano saxophonist, Rehmann is considered one of the "elder statesmen of jazz" in his native Montana, and for his annual SF performance, he will be joined by pianist, composer Nora Maki, 7 string bass virtuoso Edo Castro, and BeyondChron's very own E. "Doc" Smith, on Zendrum. Rehmann's "Special Edition" quartet is primarily an electric group that will be performing some of the music made famous by his friend and mentor Rollins, as well as the likes of John Coltrane, Thelonius Monk, Miles Davis, Horace Silver, Antonio Carlos Jobim, and originals by both Smith and Castro. A frequent visitor to the Bay Area, Rehmann's return has been a long time coming, and most welcome. Rehmann, grew up in Burlington, Iowa listening to the last of the traveling big bands in the late forties and early fifties. As a teenager, he got interested in bebop and wanted to know not only why they played like that, but how. Now he knows, and he plays it on the alto, soprano and tenor saxophones. In 1954 he began playing the saxophone in public school and started his first group, "The Reformers Combo," in high school. An admirer of many great saxophone players from Charlie Parker to Stan Getz, he has been particularly inspired by the mentoring and music of Sonny Rollins. Rehmann's trademark sound is uniquely his own, and watching and listening to him play is a joy. His regular quartet in Montana, featuring legendary guitarist Blackie Nelson, his son, the "disgustingly talented" Ken Nelson on bass and keyboards, and the remarkable Dennis Unsworth on drums, have delighted "Big Sky" audiences for years. The group's three albums, Back Home Jazz (1996), Mann Gulch Suite, (1999), and Old Friends and New (2011), have an underlying message unique to jazz, (or any other genre to be fair); protecting the environment. Rehmann's concern for a clean and healthful environment, and his desire for everyone to be made aware of the effects of pollution and global warming, are clearly a motivating, if not inspiration force in his music, and a passion shared by many of Rehmann's friends and colleagues, including the legendary saxophonist Sonny Rollins. Rehmann's delightful cover of Horace Silver's "Nica's Dream", is another fine example of his spacious, airy sound of "Big Sky" jazz, free to roam and soar, swoop and swing. "Rehmann and his Quartet," wrote Mike Clark of the Great Yellowstone Coalition, "have brought to us a sense of joy, wonder and solitude with their original jazz interpretations, which explore the interior landscapes of the American West and the meaning of wilderness". Rehmann's "Going Down the Gulch" is but one of many fine examples of that style, and embodies a true "Big Sky Jazz" sound. His most recent album, Old Friends and New, is his best yet, and his quintet's new interpretations of some great classics by Rivers, Pat Matheny, Michael Brecker and Horace Silver. This is a passionate outing by two genuine jazz veterans and the joy of playing with their family and indeed, new friends. E. "Doc" Smith has performed and recorded with a wide array of artists in both jazz, rock and world music, including Howard Levy, Paul McCandless, Paul Bollenback, Brian Eno, Bon Lozago, Ed Howard, Paul Wertico, Jack DeJohnette, and many more. His work with Brian Eno and the group the Same, featuring now famed composer Carter Burwell, and Stephen Bray, led him to join Bray and his platinum selling work with the pop singer Madonna. Smith worked with Bray and Madonna for several years, and on many of her greatest albums, including Desperately Seeking Susan, True Blue, Who's that Girl?, Express Yourself, and Pre-Madonna-The New York Years. Smith's twenty plus years of percussion work, also led to the creation of his one-of-a-kind and critically acclaimed instrument, the "Drummstick". His tours with the group Between the Lines, allowed him to open for acts as diverse as the Neville Brothers, 10,000 Maniacs, and The Violent Femmes. His invention has also led to performances with some truly great musicians from around the globe, including the Indian phenom, Sandip Burman, and perfecting his technique with Roy "Futureman" Wooten, of Bela Fleck and the Flecktones. "When Rehmann and I first played together back in 2006, I was using the Drummstick, my drum-guitar, MIDI instrument." These days, Smith is using his Zendrum ZX, a custom, digital drum instrument made for him by the Zendrum Company of Atlanta, GA.
After some gentle prodding and spirited discussions with Rehmann over the years, Smith soon hit upon the idea of a performance, and the electric version of Rehmann's Montana group, the "Special Edition Quartet" was born. "This is always a real treat for me personally, to play with an all-time great like Rehmann and good friends like Edo and Nora, I hope everyone who comes to Sheba to see us will enjoy it." SF Bay Area bassist Edo Castro initially was a self-taught bassist but later moved to Chicago and attended The American Conservatory of Music in Chicago. He completed his studies and earned a BA in 1987 with a focus on Jazz Studies and electric Bass. He continued to hone his craft in Chicago through 1990. Returning to the Bay Area, Edo released his first solo effort of original music entitled simply “Edo.” Castro’s 2nd release “Phoenix” (on Passion Star Records) made the 49th Grammy Entry List for "Best Contemporary Jazz Album" in October 2006 as did his third and latest release, Sacred Graffiti, in 2010. Castro has put his signature on over 20 local CD projects and has performed/recorded with David Amram, Mark Walker, Hassan Kahn, Pete Cosey, Roy Haynes, Fareed Haque, David Onderdonk, Ed Thigpen, Johnny Griffin, Joel Harrison, Jim Trompeter, Ian Doogle, Deborah Winters, Jill Knight, Paul Van Wageningen, Caroline Aiken, Dan Zinn, Bethany Pickens, Michael La Macchia, Armando Peraza, Caren Armstrong, Percy Howard, Mike Molenda, Stu Hamm, Lorn Leber, George Brooks, E. "Doc" Smith, Michael Manring, Mark Egan, Yves Carbonne, Todd Johnson and David Friesen. Pianist Nora Maki was born in Osaka, Japan. She started her first piano lesson at age 6. She studied classical piano with Katsuyuki Mastui and musicianship with Masaru Adachi at Osaka College of Music. Encountering jazz music in her late teens has changed her way of making music to her own terms. She studied the piano style of Art Tatum & Oscar Peterson with Minoru Ozone. Interested in jazz & American culture, she was exposed herself to a broad range of American music from Miles Davis to James Brown. After immigrating to United States of America in 1989, she went back to school and studied advanced jazz arrangement, theory, harmony & history and jazz combo under the direction of Andrew Speight at San Francisco State University. Her great passion for music has brought her to much broader music communities. She has also performed her jazz in various settings and shared the bandstand with many area musicians in San Francisco Bay Area. Maki will debut both her acoustic and electric talents to Rehmann's Special Edition Quartet, in what promises to be a lively and memorable show.